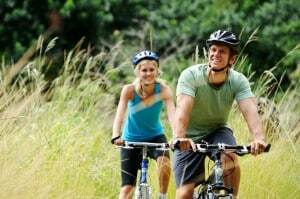 What are the fitness benefits of Cycling? Posted May 27th, 2013 by Hoffy Cycles. As far as exercise goes, it doesn’t get much better than cycling. It’s widely accepted by people that cycling is not only a way to keep fit, but has a range of other health benefits too. We’ll tell everyone who will listen of the benefits of regular riding when they visit our shop in Sandgate and in today’s post we’re going to tell you too! These may even surprise you and if you’ve not joined the cycling revolution yet, these great fitness benefits of cycling will hopefully get the wheels turning and kick you into gear…. We won’t get bogged down in the medical literature, but as far as the research goes, a moderate activity such as cycling promotes a stronger and more robust immune system. What’s not to like about a better sense of wellness? It’s not just the lower body that gets a workout in cycling, although that is the perception. It increases cardio vascular fitness and endurance levels. Need to build stamina? Try 30 minutes of cycling a day and watch your energy levels increase. A good cross section of the body’s muscles when riding are used including the abdomen and back muscles which provide stability. Your body’s skeletal system will get a good stretching from cycling, and moderate strain on the skeletal system from cycling builds strength and added mobility and also has a positive impact on bone density. Studies have shown that regular cyclists cholesterol falls as a result of cycling and in before and after tests the had less risk of heart attack and stroke through increased aerobic fitness. Apart from physical health levels, the mental health benefits of regular riding are many. Reduced stress, improved feelings of wellbeing and added confidence has all been linked to cycling. Just goes to show that cycling as an activity is good for mind, body and soul. If you’ve not yet started to cycle, or you need a new set of wheels to get back into it, come and see us at Hoffy Cycles, one of Brisbane’s oldest and most established bike shops. Go on, get on ya bike and start experiencing the health and fitness benefits of cycling for yourself today!